What history hides behind the social composition of the Kivus? While the first three episodes of the series rather concentrated on historical background and three different phases, this fourth episode will focus on impacts of refugees on local communities in North Kivu. In contrast to the previous episodes, the social composition will not be in the centre but other difficulties refugee influxes could bring with them. What happens right now in North Kivu, happened already some 15 years ago and the problems remain the same: history seems to repeat itself. 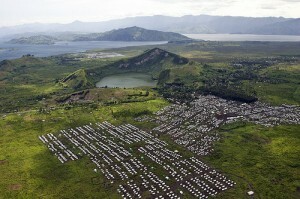 The North Kivu region in the DR Congo went through a difficult decade in the 1990s with hundreds of thousands of people seeking refuge in large camps and being internally displaced. Beside the emerging tensions between the several groups of population, other factors became highly problematic. People needed land suitable for cultivation. But local communities usually did not have any interest in sharing their fertile land around the East African Rift Valley’s volcanoes. So in result there were tensions between local villagers and arrived refugees about cultivating land. Moreover the area around Goma, North Kivu’s district capital, was that heavily overpopulated because of the enormous and sudden influx of refugees that access to water and health institutions became essential to life. The masses of new people brought a lot of diseases with them. 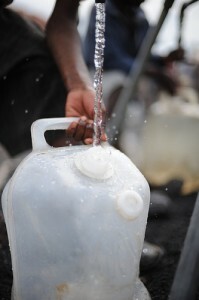 Because of a lack of clean drinking water and appropriate and enough sanitation facilities a cholera outbreak caused initially thousands of deaths a day. Such dramatic developments suggest that these diseases would have had a direct impact on surrounding village communities. Although the international community tried to set up camps, which could accommodate as many refugees as possible, they could not avoid such diseases to spread to local communities. This means that borderland communities along the Rwandan-Congolese border faced an enormously increased risk of getting ill. Health care was hardly accessible and if at all villagers could only try to get access to the health care of the international aid agencies on the scene. Besides that there were other dramatic problems the borderland villagers grappled with. Among others they faced the disposal of waste, particularly human waste. Human excreta occurred in large dimensions. In some areas the disposal was even that difficult to be disposed because of the volcanic rock soils that it was simply dumped along the road. Furthermore deforestation which was accompanied by the systematic destruction of the species-rich Virunga National Parks posed another problem. Trees were mainly cut down for the use of firewood and subsequently deforestation took on unimagined dimensions. Because some of the refugee camps of the UNHCR such as Kibumba, Mugunga, and Katale were located directly inside the parks, the process of deforestation was even more devastating. It seems that such events and problems occur again these days. 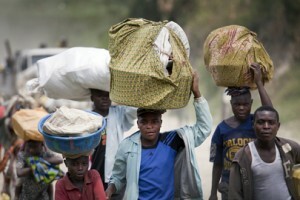 After thousands of Congolese were internally displaced since the outbreak of violence in April earlier this year, the North Kivu region faces similar problems as in the 1990s. 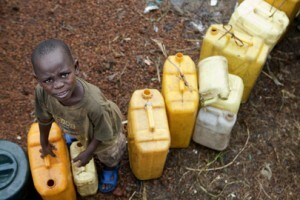 A cholera outbreak already caused several deaths and the pressure on housing, sanitation and health care facilities also increases. In the case of North Kivu it seems that history repeats itself once more and the local communities face harsh life conditions. In the upcoming episode of the KIVU-SERIES, eufrika.org will throw light on the years after the genocide and Rwanda’s new government’s military actions in the Kivus.